Note: Salesforce Adapter is not supported on Terminal Service environments at present. 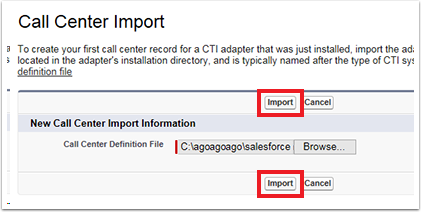 Salesforce Adapter uses Open CTI API. Please check with your Salesforce Account Manager or check supported editions at:https://developer.salesforce.com/docs/atlas.en-us.api_cti.meta/api_cti/ Please note: Lightening interface is not supported. 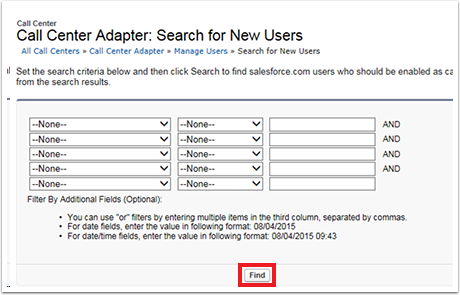 Go to the following link to download and save the adapter's XML definition file: Download Level365 CRM Connect Salesforce Adapter. Login to Salesforce as an administrator, and click Setup. 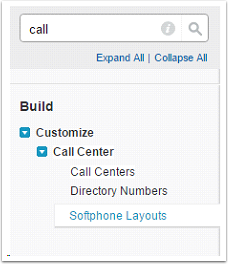 Click on Call Centers, which you will find in the Customize section of the Build area of the setup menus. Scroll down the screen and click on the Continue button at the bottom. You may also want to check the "Don't show me.." option. Browse and locate the Adapter definition .xml file that you downloaded in Step 1, and then click Import. 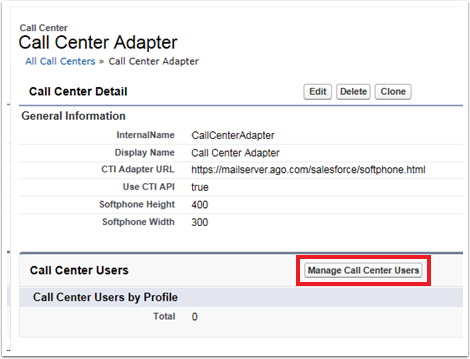 Once you have completed the import, you will be automatically taken to the Level365 CRM Connect Call Center Adapter screen shown here. Click the Manage Call Center Users button. In the Manage Users screen, click the Add More Users button to start adding users that you want to have access to the Adapter. Use the search filters to locate the user(s) that you wish to add, or just leave the filters set to none, and then click the Find button. This will reveal your filtered list of users. As shown below, tick the user(s) that you want to add, and then click the Add to Call Center button. 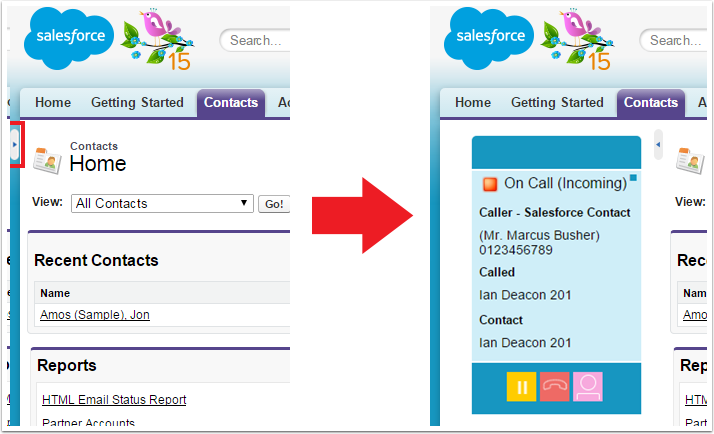 When any of the selected users logs into Salesforce and clicks on the HOME page, the Level365 CRM Connect Softphone panel will appear on the left-hand side of their screen. 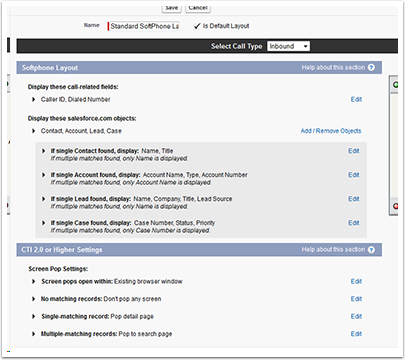 If the user has Level365 CRM Connect running and a valid CRM level license, their Softphone State will show as 'Available' and they are ready to work with the Softphone. If the user is experiencing connection issues, or their Level365 CRM Connect client does not support the Salesforce integration, their state will show as 'Not connected'. See the troubleshooting section for help. If this setting is not configured, then the "+" button will create a new lead. If not configured it is either "No matching records" is set to "Don't pop any screen" or "Pop to New '--None--'". Note: Different softphone layouts can be created and assigned for each user allowing customizing of the behavior for each user. This is not covered in this guide. Note: If the Apex class is not installed the softphone will work as usual however will not show a Timezone in the subject. Go to Setup > Build > Develop > Apex Classes. 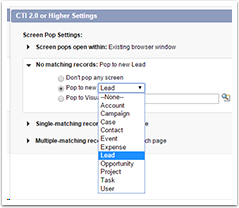 When the "Pop" button is clicked, by default, a new Salesforce Lead record is created. 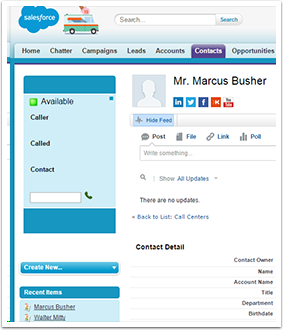 You can change this default entity in the Salesforce Settings under Call Center / Softphone Layouts. There are limitations in searching the Cases by phone number; this is a limitation of Salesforce API at time of writing. 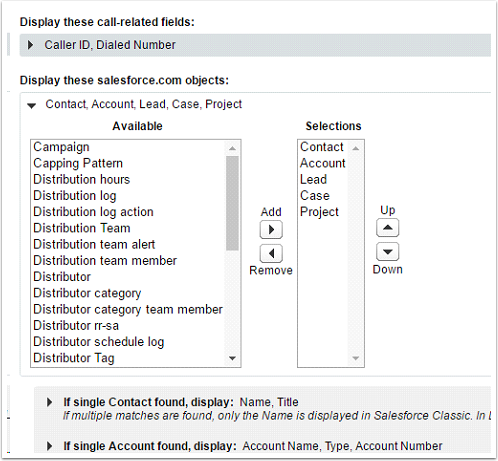 Salesforce cannot search the associated contact for a Case.